We <3 RP! It's Back! After taking a month off so they could move to a new sim the We <3 RP event is open again. I adore this event, have from the beginning and I’m thrilled that I’m allowed to be in it on a fairly regular basis. It is one of those that is always run well and has awesome stuff in it. This month I did up some stuff for those types who like to fish. It’s getting towards the end of summer and this really is something that I _usually_ have pieces to but haven’t in a little bit retiring the older sculpted stuff. Freshly meshed and I’m going to add more pieces, clutter and stuff to round it out but a new dock piece, which just so happens to kinda match the docks I made awhile back…. 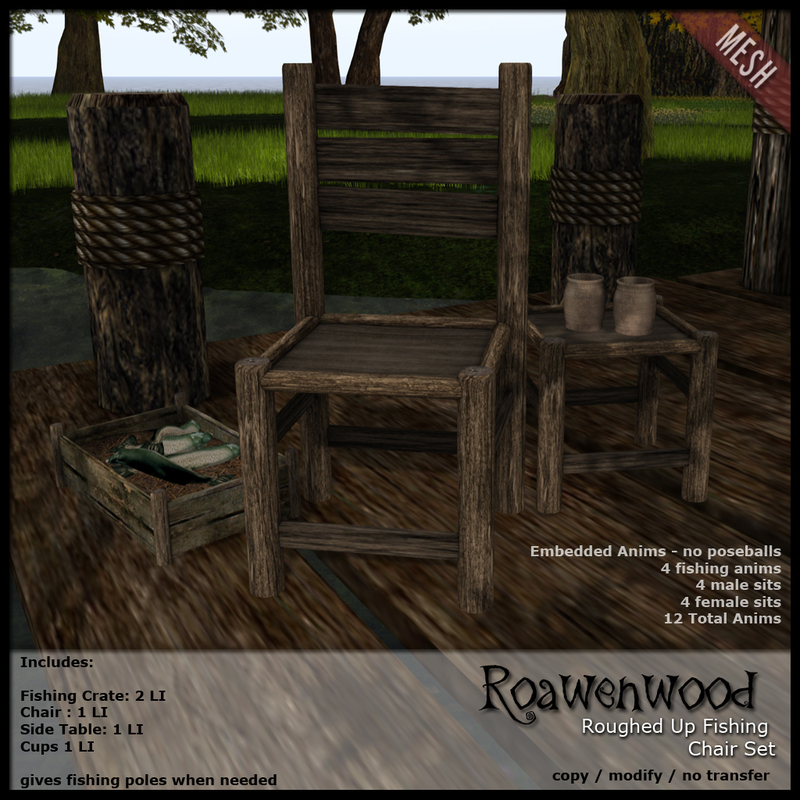 plus a fishing chair set. The set is a bit rugged, no surprise… I generally make this sort of thing kind of rough looking. The fishing chair has 12 animations total, all embedded so you don’t have poseballs. 4 fishing animations alone, and then 4 male sits, and 4 female sits so anyone can enjoy themselves. A filled crate with some fish, and a small side table with mugs included if you want to use them. I felt like it needed a little something else and kind of didn’t have time to do what I really wanted sooooooooooooooo this is a smaller set, which is cool, might make up the nicer one later on. I usually do for the fishing stuff. The fishing dock weighs in at 10 LI at it’s current size. You know how it goes, make it bigger it’ll get bigger… make it smaller and it will probably get smaller. I have fond memories growing up sitting on a dock fishing for bass, or out in the boat on the lake with my father fishing in the early morning…. casting the line up under the trees and brush along the edge of the bay… You know I have quite the good aim for this… it’s tricky not getting the lines tangled up in things, you learn quick. I hope you all enjoy the offerings, they’re at a 30% discount through this month for the event. Meaning that the pieces are only 245L and 277L I believe. REALLY good deal, and they’re copy/modify so you can have them wherever. 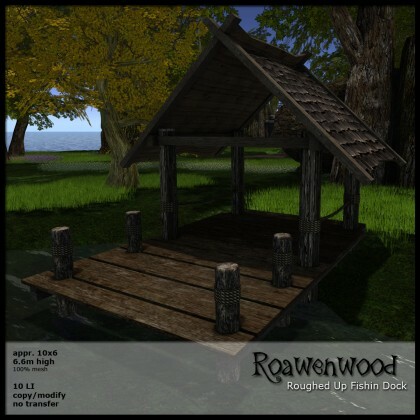 Posted in: Chores & Work, Furniture, Landscaping & Prefabs, Role-Play, We <3 RP!